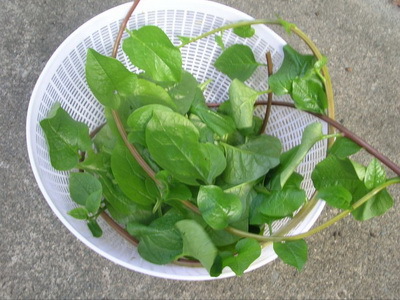 In Bangladesh I think that Indian spinach / pui shak is the most common leafy vegetables. There are two types of Indian spinach /pui shak. One is with green and other one is with red stem. You can check on the photos. But both of them are kind of same taste. We normally use prawn to cook it. But I found that chicken breast goes very well with it. If anyone wants to use prawn, recipe will be same. 1. Remove the leaf from stem and cut stem into 1.5˝ pieces. Wash leaf and stem thoroughly and drain the water. 2. Cut the breast into small pieces. 3. Heat the pan with oil and add onion and fry onion till it becomes transparent. 4. Add the chicken breast and bay leaf, when it changes the colour; add coconut cream, green chillies, turmeric salt. 5. 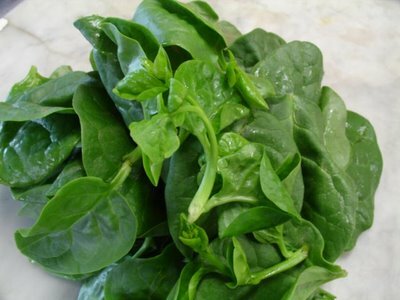 When oil is separated, add Indian spinach pieces with 1/2 cup water and cook it till it becomes tender. 6. Check the salt and add the sugar. Remove from the stove. 7. 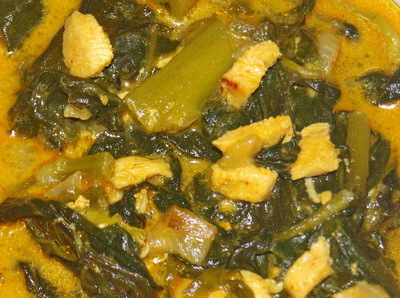 Serve Indian spinach with chicken breast / pui shaker jhol with rice.